The Microsoft Edge (EdgeHTML) DevTools are built with TypeScript, powered by open source, optimized for modern front-end workflows, and now available as a standalone Windows 10 app in the Microsoft Store! For more on the latest features, check out DevTools in the latest update of Windows 10 (EdgeHTML 18). Please keep sending your feedback and feature requests! Test on Microsoft Edge (EdgeHTML) free from any browser: We partnered with BrowserStack to provide free live and automated testing on Microsoft Edge (EdgeHTML). 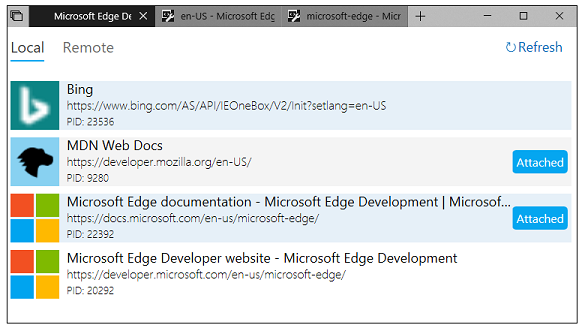 The Microsoft Edge (EdgeHTML) DevTools are now available as a standalone Windows 10 app from the Microsoft Store, in addition to the in-browser (F12) tooling experience. With the store version comes a chooser panel for attaching to open local and remote page targets and a tabbed layout for easy switching between DevTools instances. To debug a page locally, simply launch the Microsoft Edge DevTools app. The Local panel of the chooser will display all of the active EdgeHTML content processes, including open Edge browser tabs, running PWAs (WWAHost.exe processes), and webview controls. Click on your desired target to attach and open a new tab instance of the DevTools. The Microsoft Edge DevTools app introduces basic support for debugging pages on a remote machine via our newly released DevTools Protocol. With the latest release comes remote access to core functionality in the Debugger, Elements (for read-only operations), and Console panels. Remote debugging is limited to Microsoft Edge (EdgeHTML) running desktop hosts, with support for other EdgeHTML hosts and Windows 10 devices coming in future releases. To get started, check out the Microsoft Edge DevTools section of the DevTools Protocol docs. Please send us your feedback so we can continue improving the Microsoft Edge (EdgeHTML) DevTools for you! Simply open the tools (F12) and click the Send feedback button. You can also add and upvote tooling requests to our UserVoice forum and become a Windows Insider to preview the latest features coming to the DevTools. Use the Windows Feedback Hub app to post, upvote, track and get support for general Windows suggestions and problems. These shortcuts control the main DevTools window and/or work across all tools.